There were 702 press releases posted in the last 24 hours and 154,063 in the last 365 days. NEW YORK, April 17, 2019 (GLOBE NEWSWIRE) -- Today Microsoft and Steelcase introduced a new way to give teams an unprecedented level of control over how they collaborate. Microsoft launched its next generation all-in-one collaboration device built for teamwork: Surface Hub 2S. And Steelcase introduced Steelcase® Roam™, a mobile stand and easy-to-hang wall mounting system designed for the Surface Hub 2S that allow teams to collaborate almost anywhere. These solutions meet the increasing demand for rapid innovation and problem solving by helping people access the right spaces and tools needed to create new ideas. Steelcase introduced Steelcase® Roam™, a mobile stand and easy-to-hang wall mounting system designed for the Microsoft Surface Hub 2S. Great ideas can’t always be scheduled. The Microsoft Surface Hub 2S is an interactive team device with a slim, sleek design that can turn any space into a collaborative space. Microsoft worked with Steelcase to design Steelcase Roam, a mobile stand and easy-to-hang wall mounting system, that allow people to use the Surface Hub 2S to collaborate in planned sessions or spontaneously. The mobile stand can be moved easily with one hand, and its small footprint fits in all kinds of spaces. The wall mounting system is the perfect solution for private offices or smaller spaces, encouraging standing and active postures. Collaborative work at its best is active work: Neuroscience has established the strong connection between physical movement and improved creativity, learning and problem solving. Earlier Steelcase research, focused on active learning in the classroom, inspired the concept of active collaboration for the workplace. Microsoft Surface Hub 2S and Steelcase Roam support active collaboration by encouraging teams to move, stand, gesture and become more physically, mentally and emotionally engaged in their collaborative work. 75% of traditional conference rooms are enclosed, 81% of collaboration sessions are scheduled, while only 19% are spontaneous. 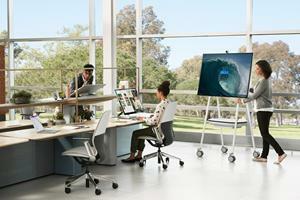 Steelcase Roam and Surface Hub 2S prime people for creative work whether they are physically together or working remotely. A more relaxed, authentic collaborative experience eliminates hierarchy since people can see eye-to-eye and encourages equal participation. Remote team members can move around with the team and participate more fully. Teammates can see and hear crisply and clearly—making sure everyone has a place at the table. “Today, collaboration is bound by scheduled meetings on our calendars and scheduled spaces in our buildings. With Surface Hub 2S plus Steelcase Roam, you have the freedom to take your ideas with you, relocate to any space, and huddle where you want, when you want. And, anyone, near or far can actively engage,” says Robin Seiler, General Manager of Hardware Engineering, Microsoft. Microsoft Surface Hub 2S and Steelcase Roam are expected to start shipping in the US in June with additional markets soon to follow. They will be sold through Microsoft authorized device resellers. For more information, visit steelcase.com/360-roam. 1 Steelcase Active Collaboration Study 2019 in Australia, France, Germany, Japan, UK and US of more than 3,000 office workers. For over 105 years, Steelcase Inc. has helped create great experiences for the world’s leading organizations, across industries. We demonstrate this through our family of brands – including Steelcase®, Coalesse®, Designtex®, PolyVision®, Turnstone®, Smith System®, Orangebox® and AMQ®. Together, they offer a comprehensive portfolio of architecture, furniture and technology products and services designed to unlock human promise and support social, economic and environmental sustainability. We are globally accessible through a network of channels, including over 800 Steelcase dealer locations. Steelcase is a global, industry-leading and publicly traded company with fiscal 2019 revenue of $3.4 billion.